The MSU Pro is one of our most flexible and economical mobile surveillance units. It offers the security of online accessible construction security cameras, along with a host of features to help realize cost and energy savings across the jobsite. Highly customizable and conveniently mobile, the MSU Pro is the perfect surveillance solution for any construction site that has power available. It is especially suited for firms that hope to keep costs down without sacrificing security. As well as its numerous security benefits, the MSU Pro is a fine choice for construction firms looking to stay within budget. Permanently mounted security solutions are typically inappropriate for the construction environment, both due to their high cost and due to the temporary nature of any construction site. The MSU Pro, with its durable, self-contained construction, is the ideal answer. Each unit is fully customizable, allowing for the perfect mix of cameras to meet both security and budgetary needs. The unit can be as simple as a group of standard cameras mounted to the mobile cart, or it can incorporate diverse features like license plate capture, 360 pan / tilt / zoom, and strobe lights. Communicates to would-be thieves that your jobsite is best avoided. Criminals are looking for an easy target. They will usually move on. Durable, professionally installed cameras, floodlights, and strobes send the clearest message. The MSU Pro works on existing jobsite power and provides both security and light. Flexible and customizable with a wide range of cameras and lighting options. Convenient and mobile to provide surveillance wherever it is needed. Cutting-edge remote management features let you view live or recorded footage from anywhere with an Internet connection, as easily as a webcam. Solar powered model available to leverage this green, renewable resource. The MSU Pro also offers an integrated LED lighting array with an optional strobe light. Uniquely suited for the construction industry, the MSU Pro can serve a hybrid function. It is an excellent solution both to secure the jobsite and to provide extra work light during the evening. The MSU Pro offers enhanced lighting over our solar powered options. Although the use of a renewable resource like solar energy is great for the environment, the MSU Pro with its efficient LED bulbs still offers energy saving over most dedicated lighting solutions. For very remote sites with little to no light, the MSU Pro is generally the best choice. A crucial but often overlooked piece of security is psychology. Visible security measures like a Mobile Surveillance Unit send a clear message to would-be intruders that their energies are best spent elsewhere. Most materials and equipment thieves are hoping to find a quick, easy, low-risk crime. They seek out sites that are obviously unprotected, proceed directly to the closest open means of entry, and get to work. Loading up pipes, lumber, or other materials into a pickup as fast as they can, thieves try to spend as little time as possible on the actual theft itself. In other words, they seek the path of least resistance. 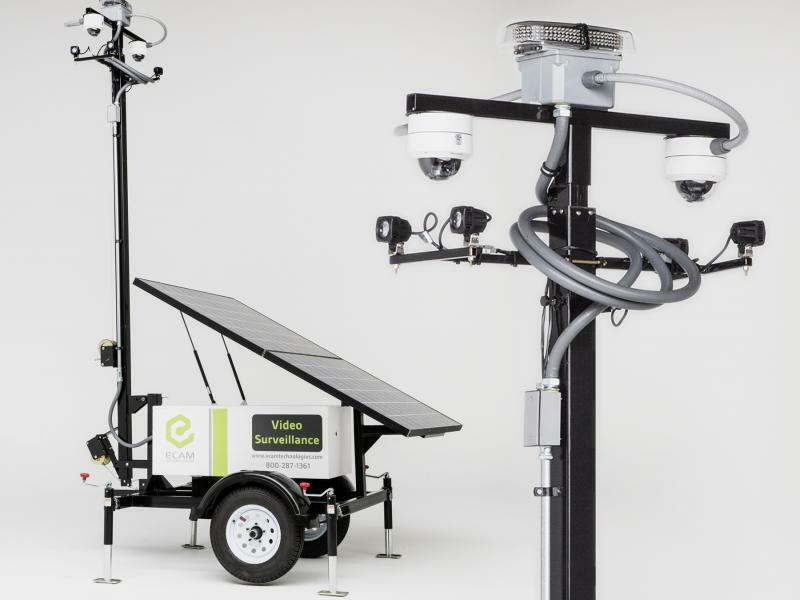 An MSU Pro, with its bright LED array, sturdy integrated mobile cart, and multiple surveillance cameras, will send most potential criminals away before they ever set foot on the jobsite. The MSU Pro is a flexible security solution, customizable to suit any needs. Efficiently leverage already existing on-site power. No separate generator required. Self-contained with all cameras, lights, recording, and network hardware built-in. Just one power connection. Sturdy trailer allows MSU Pro to roll around the jobsite for maximum security and light coverage. Customize cameras and lights to balance security and budget needs. Remote management, webcam, and UL-Listed monitoring features allow 24/7/365 protection. Uses powerful bright white LEDs to provide energy savings over traditional lighting solutions. Includes a powerful bright white LED lighting array, meaning the MSU Hybrid can also provide function as a work light for nighttime construction. Durable, mobile design means the unit can be used at the next jobsite after construction is complete. Every camera mounted to the MSU Pro is online accessible, allowing job site management to access it from the office, home, or even their mobile devices. Intuitive remote management features allow for periodic reviews of construction or overnight activity without the aid of technical support. Better still, the unit can be monitored by our 24/7/365 UL-Listed Central Monitoring Station. With this service, trained operators are able to notify construction staff, private security guards, or local police within seconds of an intrusion. Most police departments give a strong priority to alarms that have been video verified, meaning their response will be swift and decisive. During business hours when the site is populated by workers and other personnel, the MSU Pro can offer double duty as a mobile light tower. 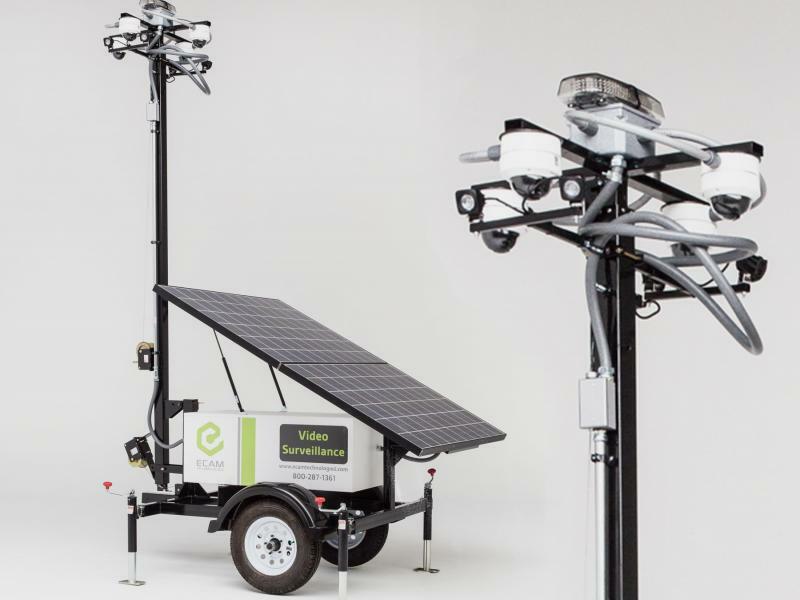 The cart that forms the base of the unit can easily be rolled around the jobsite to provide powerful illumination wherever it is needed, as long as a power source is available.